Hey guys, Anthony here again. Thank you for all your feedback on our last photography tips post. Brittany and I really try to offer value with each post and hearing your feedback helps us understand the content you want most, so thank you again! Based on your feedback, I’m going to dive into how to use your camera’s manual mode and basic photography settings. I basically knew how to turn it on and take a picture in auto. From the start, I knew I wanted to shoot in manual. From my research, I knew it was the only setting that would give me the ability to have complete creative control over the final product. However, after a few tries I got frustrated with my lack of knowledge and the horrible results of my photos… in a way, I gave up trying to figure it out for the time being. For awhile I actually shot in Canon’s Creative Auto mode (CA). It’s a great beginner setting that gives you control over image brightness and depth of field (which I will go over shortly) and the camera will automatically set the exposure and ISO settings. Extremely helpful when just starting out. This was a perfect quick-fix solution, but I had to give manual another try… especially because I felt like such an amateur using preprogrammed settings (which I was). Manual mode didn’t really make sense for me until I understood the basics: Aperture, Shutter Speed and ISO. Understanding these core settings and how they interact with each other really gave me the confidence I needed, not to mention the knowledge, to be able to shoot in manual mode. Aperture can be a difficult concept for people. It took me some time, but once you get it, it’s pretty simple to understand. I will try to break this down as simple as possible. Look at yourself through a mirror and notice your pupil (the black dot right in the middle of your eye), depending on how well your area is lit, your pupil could be really small or somewhat large. Now close your eyes for 15-20 seconds and open them. Notice how your pupils started large and then became small rather quickly? This is because your eyes are naturally adjusting to the light. Meaning, in less lit areas, your pupils become larger to let in more light and help you see better. On the other hand, if it’s really sunny outside or you’re in a bright room, your pupils will become small to balance out the light. Aperture works in a very similar way. If you look through the front of your lens, it’s the opening where the light comes through. A wide aperture will have a larger opening, while a narrow aperture will have a smaller opening. Aperture is measured in f-stops. The smaller the f-stop number, the wider the aperture and vice versa. I know, you would think a large aperture number would mean a wider opening, but this is not the case… it’s the complete opposite. For instance, the lens I most commonly use is a Canon 85mm f/1.8. That means the widest aperture on my lens is a 1.8. A wide aperture is most commonly desired not only because it allows in more light, but it creates gorgeous blurry backgrounds (bokeh). When you press the button to take a picture, the time it takes for your aperture blades to close is called your shutter speed. Let’s go back to our eye exercise. Even though our pupils don’t open and close like aperture blades, think of the shutter speed as your eyelids. Close your eyes. Now open and close them once as fast as you can. How much light do you think you let in? Now close your eyes again, but this time open and close them very slowly. How much light did you let in this time? The faster you opened and closed your eyes, the less light your were able to let in. The same concept goes for the aperture blades. The higher the shutter speed settings, the faster the aperture blade will close and allow less light. Shutter speed is measured in fractions of a second. So if your settings are set at 300, it will take 1/300th of a second for the aperture blades to close. 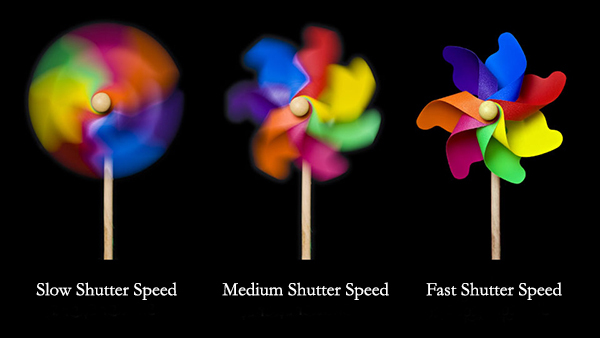 Side note: Which shutter speed is the largest, 800 or 1250? Technically 800 = 1/800th of a second, which is a higher number than 1/1250th of a second. But to keep things simple, when I say a “higher shutter speed” I’m referring to the denominator…or in this case, 1250. When all else fails…use the ISO. If it’s starting to get dark and I have the aperture at it’s widest and the shutter speed at its lowest and my photos are still coming out darker than I would like them, I turn up the ISO setting. The ISO setting is the equivalent to film speed. The faster the film speed, the more sensitive it was to light. An ISO at 500 will produce a darker photo than an ISO at 1000. Great for picking up details within a dark photo without touching the shutter and aperture settings. Provides an accurate representation of light exposure. If you can better understand these concepts, shooting in manual mode won’t be as intimidating. Ultimately, just keep practicing, you’ll find what works and what doesn’t as you test out the different settings. Have fun and be creative! Please feel free to ask any questions you may have in the comments below!